These easy bite-sized treats will be an eye-catching hit at any holiday get-together. They are a new twist on a sweet classic. 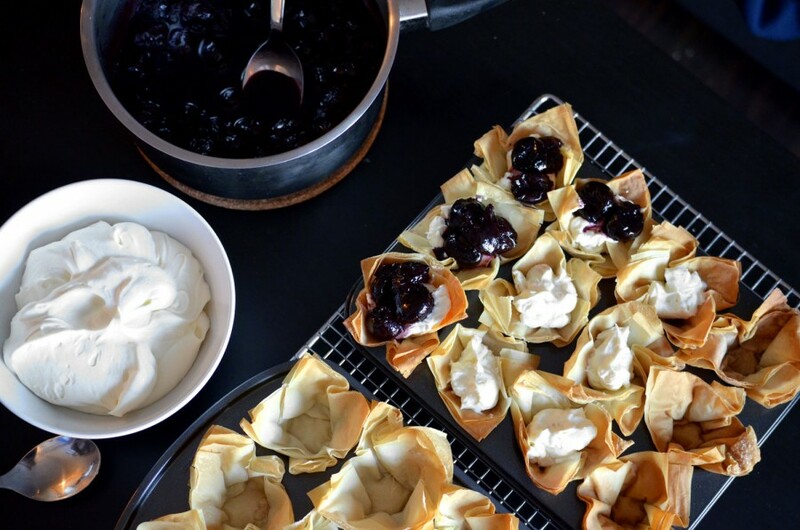 The sweetness of the berries and tartness of the balsamic vinegar are perfectly complemented by the creaminess of the mascarpone and crunch of the phyllo. Place the berries and balsamic vinegar in a saucepan over medium heat. Gently simmer until the berries have softened and the liquid is slightly thickened. This should take about 15-20 mins. Set aside to cool. Meanwhile, begin to create the phyllo baskets. Place one phyllo sheet on your kitchen counter. Using a pastry brush, brush the phyllo sheet with a thin layer of melted butter and sprinkle with 1/2 tsp sugar. Layer the first sheet with another sheet of phyllo and repeat the butter and sugar steps. Continue this process until the phyllo stack is three sheets thick. Top with a final sheet of phyllo. Set aside. Repeat with the remaining four sheets of phyllo to create a second phyllo stack. Cut each of the two phyllo stacks into 4 inch by 4 inch (or 10 cm by 10 cm) squares. This should create 12 squares from each phyllo stack and a total of 24 squares. Using the pastry brush, grease the mini-muffin tins with the remaining melted butter. Place a single square in each of the greased mini-muffin tin cups, pressing the square to the bottom of the tin to form a little basket. Repeat with remaining squares. Place in the oven and bake for 5-10 mins or until golden brown. Once done, remove and set aside to cool. These baskets can be made up to a day ahead and stored in an airtight container. Next, using an electric mixer, whip the mascarpone, cream and icing sugar in a medium bowl until stiff peaks form. Keep this mixture covered in the fridge until ready to serve. To assemble, spoon the mascarpone mixture into the empty phyllo baskets until each basket is about 2/3rds full. Place 3-4 berries on top and sprinkle with icing sugar. Assemble the baskets just prior to serving. Serve 2-3 per person.